Manchester City centre-back Nicolás Otamendi has emerged as a candidate to replace veteran Pepe at Real Madrid next season, according to leading Argentine news source TyC Sports. The 29-year-old is something of a ‘marmite’ figure among City fans, with some loving his all-action style and others not so enamoured by his habit of diving in, often with consequences. However, Otamendi was one of La Liga’s best defenders before his move from Valencia to City and still has admirers back in Spain. With Pepe more than likely to end a glorious decade-long stay at the Santiago Bernabéu this summer, with Manuel Pellegrini’s Hebei China Fortune thought to be his most likely destination, Real Madrid are considering their options. 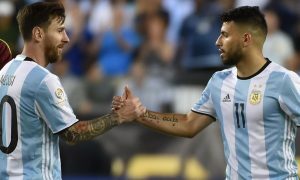 And according to TyC, Otamendi is a candidate to bolster Los Blancos’ backline, where he could form partnerships with Sergio Ramos and Raphael Varane. The Argentine international has started 19 of City’s 25 Premier League games this season, and is an important part of Pep Guardiola’s squad as it stands. It remains to be seen if that is still the case after what is expected to be a busy and expensive summer at Manchester City, largely centering around reshaping the defence.